Now is the time to start planning for the summer! Whether you are interested in voice, lyre, music education, or all of the above, there is something for everyone and every level. Explore these national and international retreats, conferences, symposiums and academies on our events page (click here to go to Events). Remember to check this page regularly for updates! I have been volunteering for six months in a hospice environment. A friend of mine recently loaned me a pentatonic children’s lyre which has seven strings and is quite small. When I go from one retirement home to another, I often have my hands full and cannot carry a larger instrument. In addition, I am not a musician at all, so this simple instrument is not intimidating. 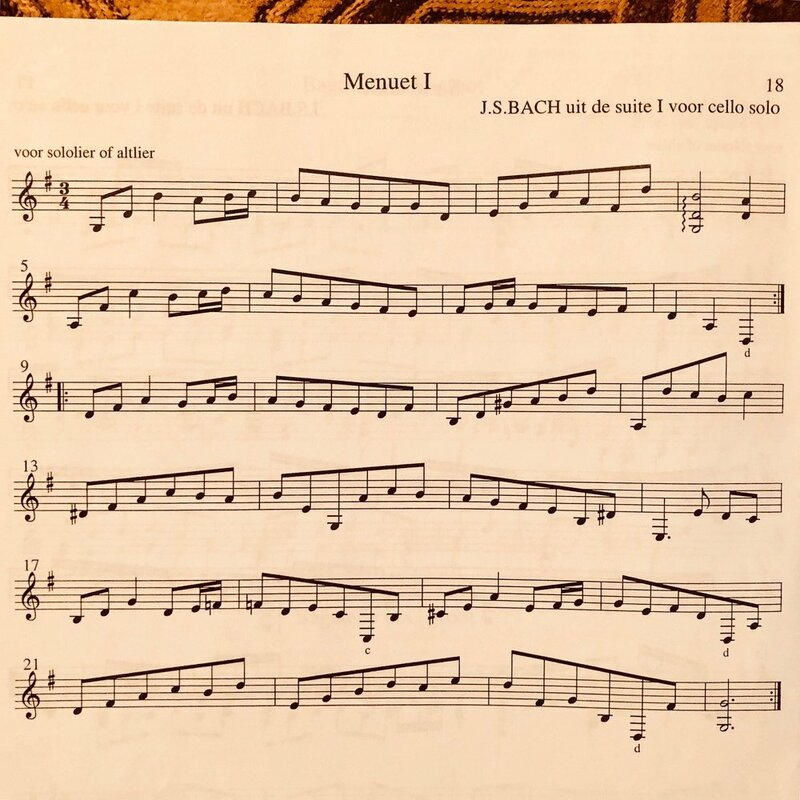 When I sit on my own couch and play the seven strings of the children’s lyre in various combinations, I experience a change coming over the room. My experience is that the room becomes ‘’living” in a new way, filled with plant-like forms or forms in movement. Normally our speech and most sound creates a mineral-like effect on the air. However, there are new possibilities for both speech and music when either is directed toward healing others through one of the therapeutic arts. On one recent occasion, I entered a room where a patient was in great pain, moaning and panting. The nurse at the bedside was flustered and struggling to administer some basic care that needed to be done, but the patient was afraid to be touched. I asked if I could try to play the lyre for the patient. The nurse responded, “Frankly, I am willing to try anything”. I sat right on the end of the patient’s bed where she could see me and started to play a few tones. She stopped moaning and looked at me and the lyre. The nurse waited a few minutes herself and then proceeded to clean the patient's mouth and eyes and administer other basic care. The patient was completely cooperative and silent. The nurse did a few other things and then said to me, “This is amazing! Can you stay for a few more minutes while I locate her doctor?” I agreed. I played for another 15 minutes, and the patient went into a deep sleep. A nurse came in again and said that they had decided not to disturb her and wanted her to sleep. On another occasion, I entered a large room where four elderly ladies were sleeping, each in a hospital bed with partial curtain drapes between them. This is the cheapest kind of room in the facility, but on this day, the room was glorious. Each woman had some kind of colorful, knitted blanket at the end of her bed. The sun was pouring into the room, the sky outside the window was crystal blue, and the snow was sparkling white. I noticed several large and beautiful pine trees standing like guardians just beyond the window. I sat in a chair and played the children’s lyre while they slept. The sun warmed my back, and the breathing of the four women filled the room, along with the living sounds of the lyre. There was no death to be felt anywhere in this space at that moment. When I arose to leave, the woman in the bed closest to my chair opened her eyes, smiled, and waved gently to me as I gathered my belongings. I smiled and nodded back, my hands and my heart full of appreciation for these beautiful and brave souls gathered together at the end of their lives in this sunny room in southern New Hampshire. In the beginning of the 19th century, the folksongs of the Hebrides were collected and recorded by Marjory Kennedy Fraser and Kenneth Macleod. Piano accompaniments for the songs were composed by Marjory Kennedy. Until recently, three volumes of these unique and hauntingly beautiful songs have been available for purchase, although they are now only available through libraries or in private collections. Beatrijs Gradenwitz has done an amazing deed to draw from these hard to find volumes and create lyre accompaniments from the original piano accompaniment scores. The accompaniments are not difficult and could be mastered by any intermediate player. Of necessity, the accompaniments span a wide tonal range, so certain instruments may be required to tune the lowest string down in some places, but there are soprano or alto range indications before each song. The simple melodies could be played by any melody instrument, such as lyre, flute, or even violin. For this reason, no words appear beneath the notation, however, a separate supplement for singers is included in both volumes with the full melodies and all of the words in both English and in the original Gaelic! 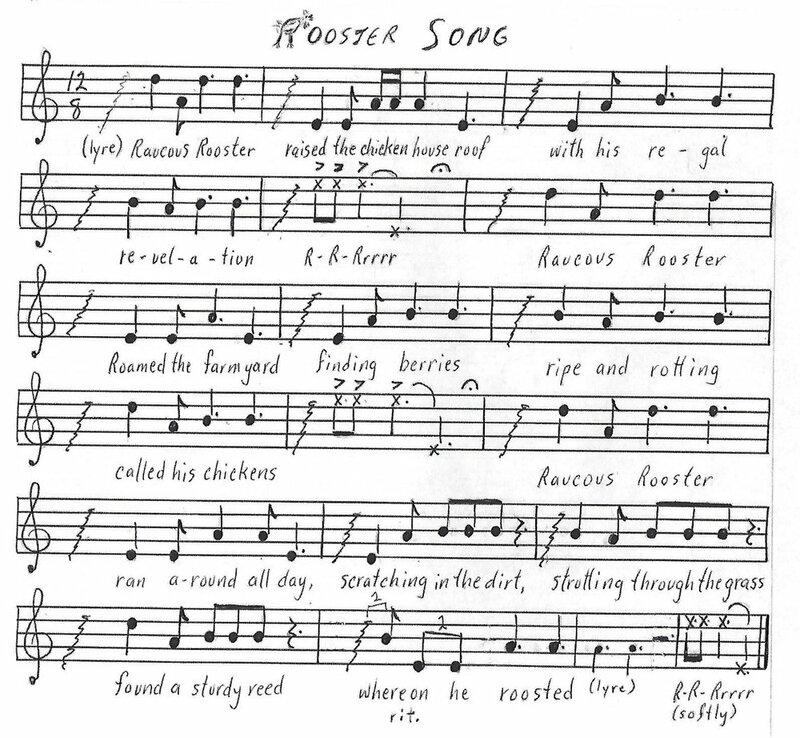 The melodies to be sung differ occasionally a bit from the instrumental versions because of the rhythm of the words, but the accompaniments fit either the instrumental or the vocal melody line. In Part One, we find eight selected songs from the original Volume I, and in Part Two, she offers us eight more selections, this time from the original Volume 2. These Hebridean songs are a real treasure, and to have them available to play both melody and well arranged lyre accompaniments based on Marjory Kennedy’s classic piano accompaniments is a real gift to lyrists worldwide. If you are not familiar with songs from the Hebrides, you are in for a real treat with these two excellent collections of lyre arrangements suitable for early stage to advanced level players or singers! The "Slow Air" has it's roots in the unaccompanied singing of songs in the Gaelic language. A visitor to Gaelic speaking parts of Ireland may still today encounter something of this in an evening at a local pub: in between the whirling of jigs and reels played by a multitude of instruments there may come a quiet moment when some individual will begin the slow heartfelt singing of such a "Slow Air," and time stands still and you dare not break the spell by speaking - or even sipping your pint ... until the reels and jigs start up again. The unembellished melody with chord symbols above and the chords notated underneath - on the same stave to complete a triad with the melody note. I've had the good fortune to test many of these tunes with lyre ensembles in Australia, China and Ireland and am pleased to confirm: they are great! For groups with different ability and experience levels they are perfect, there really is something for everyone. Well done, Mr. Clark! As for the melodies themselves: they are a veritable treasure trove. Most of the fifty nine melodies (ninety when Volume 3 appears) are freely accessible to anyone who searches but the searching is actually quite a lot of work and John, with some assistance, has done that work. As well as enjoying the collection as described, in ensemble playing, I am finding a lot of inspiration personally in getting to know these tunes and have begun taking some of them as a starting point for my own arrangements - thanks a million, John! To summarize: Irish Traditional Slow Airs is a gift to the lyre world! Help us keep our lyre community connected! ...and would love to include a contribution from you for our Spring 2019 edition of Lyre Notes! We welcome news, stories, photos, and announcements of lyre happenings in your region. Our copy deadline is March 15th. We look forward to hearing from you!! Please send your contributions to wendypolich@hotmail.com. LANA's online music/book store, click here. Recent blog posts and book reviews, click here. Upcoming events in your area or worldwide, click here. Back issues of Lyre Notes, click here. LANA membership, or if you need to renew, click here. Thank you and happy lyre playing! This book, a guide for playing the 7-string pentatonic children’s lyre, originally published in German by Mechthild Laier and Gerhard Beilharz, has been newly translated by Veronika Roemer and edited by Sheila Johns. In October 2018, I taught morning circle movement and music (lyres included) to the Module 2 students of the WECC (Waldorf Early Childhood China) training at a mountain resort near Xi’an, in the north of China. One day, in the second week, we all met in our luncheon room at the hotel, and Guoqi, our training coordinator, brought in two guests, both musicians, who came from the province of Zhuhai in the south of China, where they had just attended a music workshop with LANA president Sheila Johns, sponsored by local lyrist Vicky (Zhiying) Deng. Both of the student musicians live in Xi’an, and for some reason, Vicky apparently knew that I was in Xi’an and asked them to bring one of her Angel Wing children’s lyres to me as a gift from her. So the man gave me this black case and said “it is a gift….” I had no idea what was in the case, and when I opened it and found a lovely letter from Vicky along with one of her beautiful Angel Wing lyres, I was overwhelmed by such an amazing surprise and generous gift from her. In my afternoon class, I showed and played my new lyre for the students right away, and they immediately wanted to know where they might purchase one. It took me awhile to find her phone number and email address to thank her and to ask where the students could order one of her lyres. So why did she give me this lyre right out of the blue? The year before, I was in Zhuhai, mentoring kindergarten teachers (as well as doing graduation assessments) and giving some musical advice to grade school teachers, including the importance of practicing their lyres. Vicky was there to help. One day, she asked me if I could have a look at a new lyre that she had designed and built with other people whom I had not met. When I saw this lyre, I was astonished at how beautiful it was sculpted and finished and how wonderful it sounded - better than any model I had heard before! Even the Choroi kinderharp, which I had esteemed the highest quality among all the ones I had seen and heard, did not sound as beautiful as this to my ear. 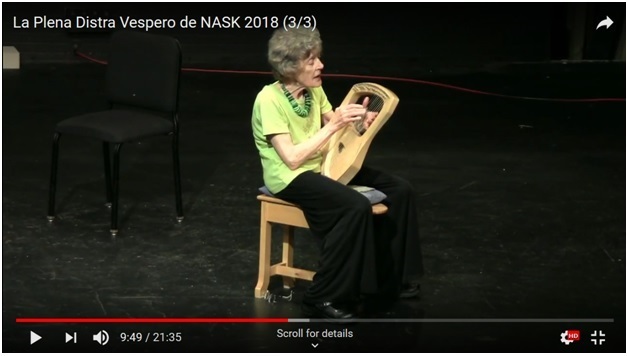 I shared these impressions with Vicky, emphasizing how happy it made me to see such a high quality lyre created in China, where I had seen so many cheap but poor copies of the well-known Swedish and German kinderharps. This lyre not only looks beautiful and sounds exceptionally good, but it is also easy to tune and keeps the tuning pretty well, too. Vicky told me that the lyre was given to me as a response to the praise I gave to this new creation, which helped her to be confident about her work and research. It made me very happy and deeply grateful for this experience: the surprise as well as the instrument itself, which was created with such love and care. Usually on my trips to China, I do not take my own lyre with me in order to save weight and volume in my luggage, but now, I have to, because there is not yet another such Angel Wing lyre available for my teaching, and I do not wish to play any other children’s lyre anymore. I wish Vicky and the group she is working with, musical and financial success with the creation of these new and beautiful instruments. After four consecutive years of enthusiastic teaching and joyful singing, Christiaan Boele returns to bring “The School of Uncovering the Voice” back to our community for a three-day workshop. Out of the artistic impulse developed by Mrs. Valborg Werbeck-Svärdström under the guidance of Rudolf Steiner, Christiaan offers a refreshing, motivating and inspiring approach for the novice and professional alike. All are welcome who long to sing, even those who feel they cannot! No special talent required. Two sessions each day: Session One: 9:35-10:45am; Session Two: 11:15am-12:25pm; $125 in advance, $150 at the door. For information contact Eurythmy Spring Valley: 845-352-5020, x113, info@eurythmy.org. For anyone interested in singing in a holistic, spirit-filled and heart-opening way! Discover the innate potential of your voice. Welcome singers of all levels, musicians, teachers, and any person yearning to sing with creative renewal. No special talent or musical ability required. Friday 6:30pm-8:30pm; Saturday 9:00am-6:30pm; Sunday 9:00am-12:30pm; Tuition $225. For more information or to register contact Shannon Boyce at 646-932-6062 or shannonaliciaboyce@gmail.com. Christiaan Boele trained at conservatories in the Netherlands and Germany and is the leading authority in the Werbeck method. He has devoted his life to The School of Uncovering the Voice, performing, conducting and teaching courses around the globe. We will work with metal instruments (gongs, rods, cymbals, and others), stringed instruments (lyres, including pentatonic and Bordun lyres, psalteries, chrottas), wind instruments (C-flutes, pentatonic flutes, ocarinas), and percussion instruments (drums, rattles, etc.). Our work will be based on the books by Reinhild Brass (Hörwege entdeckenI) and Gerhard Beilharz (Musik in Pädagogik und Therapie), focusing on new methods in music pedagogy and therapy, as is possible with these new instruments. No previous musical experience necessary. This conference will be led by Veronika Roemer, professional violist, pianist, and Seminar Music Teacher at The Camphill School, Glenmoore, PA. Veronika also teaches musical renewal in China, Hungary, and North America. Since August we live and work in Campinas / Brazil! 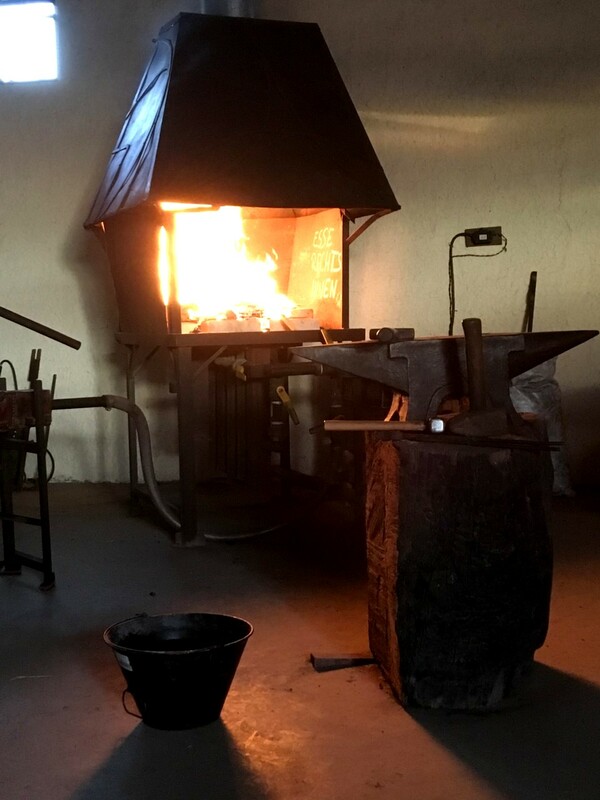 Our blacksmith's workshop has been set up since September and some instruments have already been made for Brazil, Germany, and other countries. We have also developed a new instrument: a diatonic “Glockenspiel” (metallophone) C5–C6 and pentatonic D5–E6. The diatonic can be seen and heard in this video with a happy Christmas carol. Anyone interested in our instruments can contact us via e-mail (metal.georg@gmail.com) or telephone / WhatsApp (+55-19-997969503) or visit the website www.metalgeorg.com for details. This is a lovely collection of Baroque music by French, German, and Italian composers, many of them probably new discoveries for most lyre players. Some of the pieces are edited in two separate keys for both soprano and alto lyre. Although the arrangements are made for a solo player, many of the pieces can be played by two players (stems up and down). The difficulty level is rather high when played solo. However, this should not be seen as a deterrent, as the wide variety of pieces offers wonderful opportunities for expanding and refining one's technical skills, such as finger dexterity, damping, playing separate voices at the same time, and interpretation. Petra Rosenberg isn't giving any dynamics, tempo indications, articulation or fingerings - a wide field for discoveries for each player! December 1, 2018 will always be an unforgettable day in my life with the lyre. On that day, I accompanied two kindergarten classes with my lyre at the Advent Spiral held at the Rudolf Steiner School in New York City. It was the first time I played the instrument in public. Together with four teachers singing, in the darkness, we welcomed over 20 students in each class, playing "Over Stars," "Dona Nobis Pacem," "Marjatta," "November," "There Comes a Galley Laden," and the Hebrew song "Hava Nashira" over and over. The classroom was packed with students and their families, and we played for an hour until the last student had placed his candle and exited the spiral. We then welcomed the second group and played for another hour. Including rehearsal time, I played the lyre as a soloist for over three hours that day, in front of nearly 150 people. Reflecting on that occasion, I am reminded of the historical facts of the near coincidental birth of the modern lyre (1926), the Advent Garden (1926) and the Rudolf Steiner School in Manhattan (1928) as the first Waldorf school in North America; of the particular impulse on the part of those visionaries who created the therapeutic musical instrument, the seasonal ritual and the school. If music is a "revelation of the cosmic world" as the anthroposophic music historian Anny Von Lange has written, the Advent Garden allowed me to have a first-hand experience of the revelatory nature of music, complemented by a sensory appreciation of the solemn beauty of candle light, the children's movements, the teachers' singing, the warmth of the room and the fresh spruce scent, while sharing all the above in time and space with the community. A few days after the Advent Garden, I feel a new strength in the center of my body; and that the candle light placed in the spiral by those 40 kindergarten children and their teachers is now internalized in me. Never have I felt such joy and strength at this time of the year. I would like to thank Ms. Myra Friedman of the Rudolf Steiner School for kindly inviting me to play for the occasion; also my lyre teachers, Kerry Lee and Channa Seidenberg for helping me to prepare for this event. In an early stage of the preparation, Kerry provided me with an authentic edition of Pracht's "Over Stars," and also with some wonderful literature about the history of the Advent Garden; toward the end of my preparation, Channa sang along and encouraged me while I played the lyre. 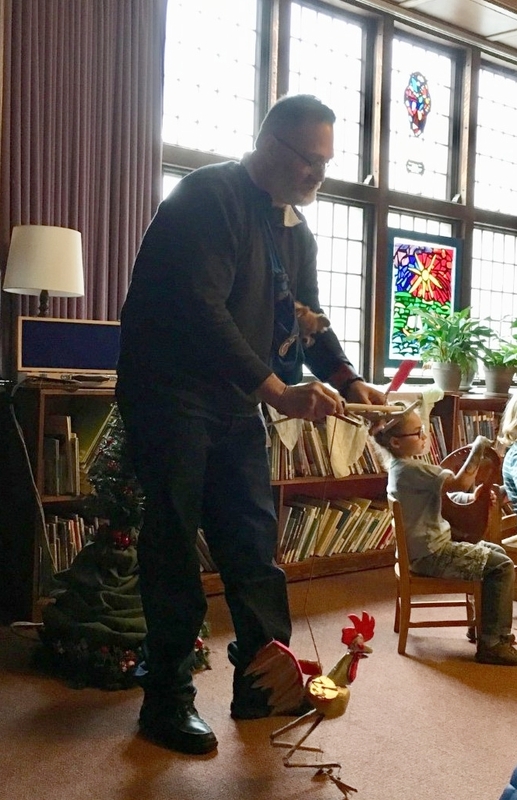 Strangely, however, the most memorable moment came on Sunday morning, the day after the Advent Garden, when my four-year-old son Leon hummed "Over Stars" from the beginning to the end, while he was playing with his toy trains. I was all ears, nearly petrified, pretending not to notice anything. My heart was trembling. How had he learned the song? I hardly ever played the melody of the song, because I was only concerned with learning the arpeggio accompaniment. I must have been singing unconsciously, while practicing "Over Stars" every day of the previous six weeks. Leon was too young to participate in the Advent Garden at school this year. I hope to accompany him next year! On December 2, I also played the lyre at an Advent Garden at the New York branch of the Anthroposophical Society in America. This was a cozy gathering of thirteen adults, and we closed the evening with my playing the introduction to Leonard Bernstein's "A Simple Song." Performing at these two Advent Gardens made me realize that the sound of the modern lyre is inherently relational and therapeutic, and unlike other solo instruments, it thrives when it is played for people in a communal setting. I am grateful for having had these first opportunities to share the joy of lyre playing with others, and look forward to further musical interactions in the future. At Hawthorne Valley School the alto lyre and 3 children’s lyres sounded in the Thanksgiving Assembly as the 3rd grade performed Arnold Logan’s “Johnny Hears the Call”. This is a delightful little musical about Johnny Appleseed, and this year it was accompanied by Diane Barnes on the alto lyre. Three of the students then played the children’s lyres on the Wagon Wheel song. The performance was much appreciated. Also in the Berkshire-Taconic region the lyre continues to sound frequently at the Christian Community and at the many Advent Gardens being held at this time of the year. Diane Barnes will be playing the lyre for the Madonna Series further south, at the Housatonic Valley Waldorf School in Ct., on December 11. This is such a wonderful time of the year for the lyre. May it sound around the country. 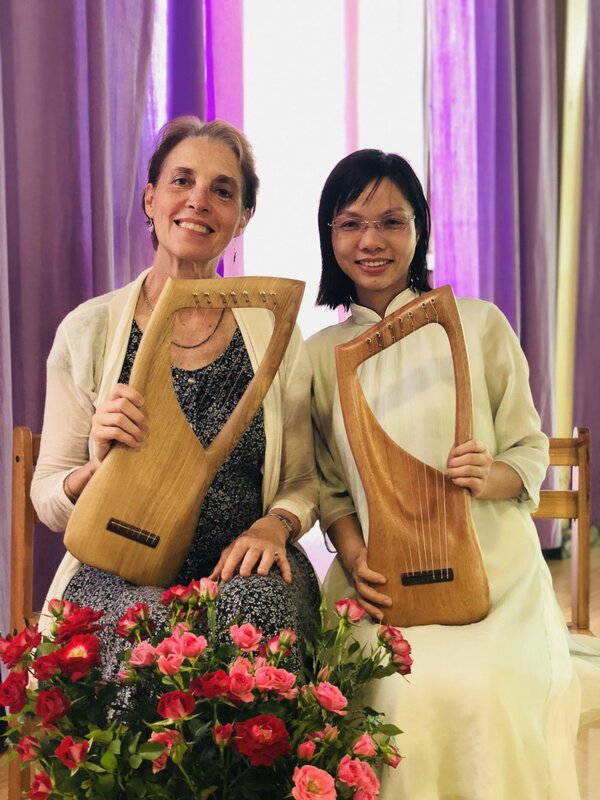 It was mid-May of this year, and I had just finished teaching a lyre course with Japanese lyrist Tomoko Mino in the province of Zhuhai in the south of China. We were enjoying dinner with our host Vicky Deng, when the two of them suddenly asked me if I planned to go to Germany to attend the first International Summer Lyre Academy in July. I had been so busy traveling, teaching, and performing both in and out of my adopted home country of Ecuador, that I wasn’t quite sure what they were talking about. They excitedly explained that two of our most accomplished international master lyre teachers, Martin Tobiassen and Christian Giersch. were teaming up to offer this academy to experienced lyrists who wished to deepen their playing skills and enjoy some more advanced ensemble work. They informed me that they had both registered and planned to go – Vicky from China, and Tomoko from Japan, and they begged me to consider joining them! I had a deep regard for Martin and for Christian, both as musicians and as human beings, and I immediately began to imagine what a fantastic opportunity this would be. As soon as I returned home, I wrote to Martin, who had been our master teacher guest for the LANA Summer Lyre Conference in 2016 at the Michael Fields Institute in East Troy, Wisconsin. I was warmly welcomed to join those who had already registered, and I immediately began searching for the best flights between Quito, Ecuador and Frankfurt, Germany. In the end, the participants in this first ever Summer Lyre Academy created a remarkably international group of nine students, two teachers, and a wonderful cook. In addition to Tomoko, Vicky, another Chinese lyrist, and myself, we had participants from Holland, England, Germany, and Brazil. We spent a truly magical week together. The setting for our work was the fairy tale Schloss Seehaus, a Baroque style castle built in the 16th century, with current construction dating to about 1780 and located in the Schwarzenberg region of Bavaria. The Lord of Seehaus is an accomplished singer with a great love for music making of all kinds, and during the summer months, he makes these stunning period buildings and grounds available for ensembles, choruses, orchestras and summer music workshops as well as sponsoring a concert series in the exquisitely appointed chapel wing of the castle. Each room is a work of art – most filled with period instruments, and I counted over 20 keyboards of some kind or other throughout the various wings and rooms of the Castle. We each had our own unique lodging within the castle, and we enjoyed 3 beautiful homemade meals together each day in the original castle kitchen, prepared for us by a colleague of Martin and Christian who himself is a lyrist. Prior to our arrival, we had each been asked to prepare a solo piece of music as well as to submit suggestions for ensemble music we would like to play with others. In addition, Martin and Christian had each chosen and sent us plenum pieces which we were meant to work on together. Each participant could sign up for 4 private lessons during the week. Most of us chose to have 2 lessons each with our two master teachers. In addition, we spent the first evening pouring over all of the ensemble music and forming ourselves into small groups according to who wished to play what. After a delicious hot breakfast, we began each day with a morning plenum where we worked together on a lively 12-tone Kanon of Christian’s as well as a stunning 3-part piece of Martin’s called Morning Bows. The approaches and musical styles of Martin and Christian were utterly and delightfully different from one another, which created a rich and complimentary experience for all of the participants! The rest of our days consisted of private lessons, practicing on our own, and rehearsing with our various ensembles, punctuated by fabulous meals, usually outside in the beautiful gardens overlooking the gorgeous castle grounds and surrounding countryside. We spent our evenings playing for each other, which was a lovely experience – each one choosing to improvise or share something prepared in a completely accepting atmosphere of deep listening and appreciation for all efforts made, however modest. 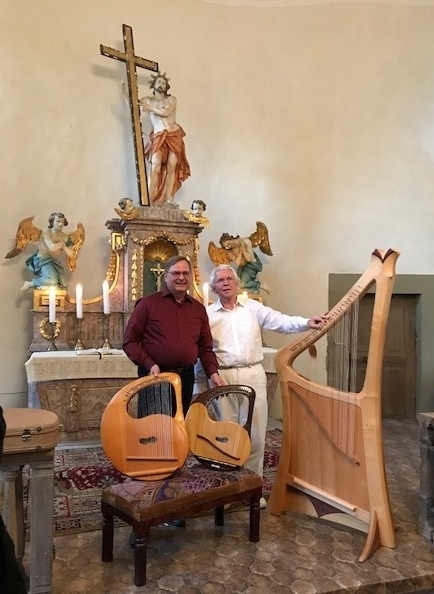 Halfway through our week, Martin and Christian presented a full public concert in the royal chapel as part of the Schloss Seehaus Summer Concert Series, accompanied by wine-tasting from the castle private label winery. On the last evening of our Academy, the 9 of us joined our teachers and presented a public concert together reflecting the variety of solos and ensembles on which we had worked during the week. If all this sounds like a dream for any lyrist interested in improving their lyre technique, improvisation, musicianship, listening, and ensemble skills, I can assure you that IT WAS!! To add the charm and beauty of our unique setting as well as the rare opportunity to share such an intimate social experience with fellow lyrists and such incredibly accomplished teachers created a very special and truly unforgettable experience that continues to inspire me all these many months later. Even though we did not share a common spoken language, the air around us filled with a beautiful cacophony of German, English, Chinese, Portuguese, and Spanish, we quickly discovered that our universal language of music made it possible to make a genuine connection with each person as we joined our lyre sounding and singing voices in creating a tapestry of musical harmony together. Thank you, Martin and Christian, for creating an inspiring new opportunity to affirm our humanity through using the medium of the lyre to deepen our social and musical potential for the future! Sheila Devlin at the Esperanto North American Summer Course. To hear her sing and play, click here and go to minute 8:47. “If I should speak with bravest fire, and have the gift to all inspire, but have not love my words are vain, as sounding brass and hopeless gain. If I should give all I possess, and striving so my love profess, but not be given by love within, the profit soon wears strangely thin. This of course reminded me of singing Channa Seidenberg’s beautiful arrangement for chorus and which has much extended text. I knew there would be an entertainment evening as a finale to our Esperanto studies. I knew that my voice and lyre might not project sufficiently in the auditorium. I went anyway to submit my entry for consideration by the “Lord High Great Auditioner” (Such humorous reference indicates only my tentative approach to the affair). SHE, Alena, was as gentle and encouraging as could be. There were just the two of us in the auditorium. When my less than two minute song was finished, she came down the aisle with glistening eyes and generous praise for having heard one of her favorite melodies with Esperanto words. The freedom we enjoy by releasing lyre tones a certain way and the freedom we display when choosing Esperanto as an egalitarian form of communication are relevant forms of expression available to us all. Both expressions give me joy. Your next summer Lyre conference sounds terrific! 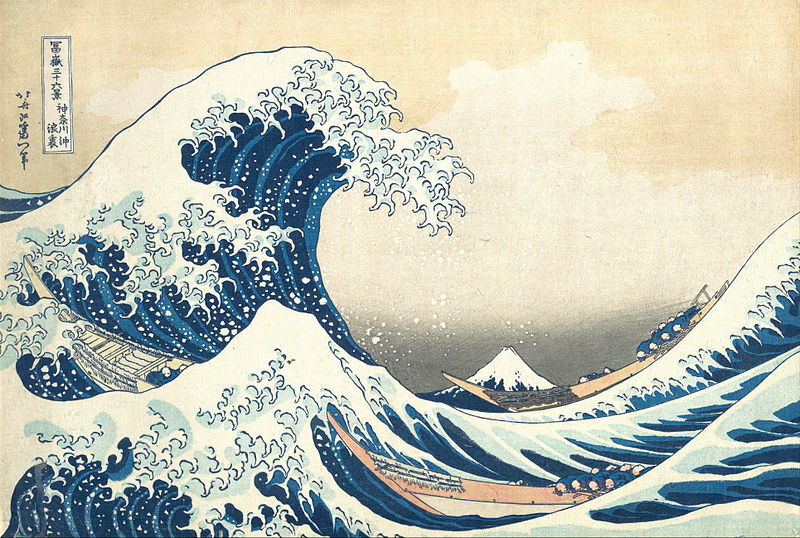 While you will be creating fantastic sounds on all kinds of instruments, I will be using my “bell rods,” as I call them, to accompany a poem inspired by paintings from the famous Japanese artist, Hokusai. It is called “Hokusai Says” by Roger Keyes. Now that I’ve got my Esperanto version to rehearse, I will start striking tones each time the poem reads “Li dir” which means “he says.” What Hokusai says basically is “Let Life Live Through You.” I fantasize that there could be a whole orchestra of you accompanying this poem. Your Lyre conference is from July st through July 5th and the Esperanto NASK 2019 starts June 31st and finishes July 7th. This seeming conflict occurs most, if not every, year. I’ll be with you in spirit because of the inspiration you give. One of the many great aspects of the international lyre conferences is the opportunity to meet talented lyrists, composers and arrangers from a variety of cultures. When I met Cecilia Unsworth, I was impressed with her knowledge and arrangements of traditional songs from the British Isles. Her “Come with me to the West” is a treasure of these melodies, many of which are familiar in North America, too. I highly recommend this collection of these rich musical songs of the Hebrides. They are suitable for the solo player as well as ensembles from Beginners to Advanced. We would love to hear from you about a favorite, or overlooked, selection from one of our listings on our Music for Sale page. Send your reviews to wendypolich@hotmail.com. We hope that everyone in the lyre community is aware of the riches in our journal, Soundings: A Lyre Review. Each issue of Soundings is published in two parts, one containing articles of real substance and permanent value and the other containing music. Soundings - Volume 7 is about to be released! We warmly invite you to join the Lyre Association of North America if you are not currently a member. Members not only support the work of the Lyre Association but also receive an annual subscription to Soundings and a discount on our conference fees and music sales. The annual fee is $50 for supporting members and $40 for regular members. "In these days of the … anniversary of building the first lyre (in the night from the fifth to sixth October, 1926), one’s thoughts turn to Lothar Gärtner. Together with Edmund Pracht, he willed the lyre out of its own ether movement, if one can say so. This truly was a Michaelic deed." Another special feature of volume 5 is POETRY by Christian Morgenstern (Krishna Mood) and Catherine Decker (Earth Hush). * Back issues of Soundings are available for $9.50 each plus shipping. Members receive a 5% discount. Send a check (payable to "LANA") to 2237 Kimberton Rd, Phoenixville, PA 19460 or send money to PayPal.me/LyreAssoc. For a list of music and books available from the Lyre Association, click here. To receive FREE SHIPPING on your next order (US orders only), use this code on checkout: “BOOK-REVIEW1.” See Music For Sale on our website at www.LyreAssociation.org. The 2018 Annual General Meeting of the Lyre Association of North America was held on July 24th at the lyre conference in Zeist, Holland. Sixteen members and friends of LANA from five different countries (U.S., Brazil, Ecuador, China, Germany and the U.K.) were present. The current Board President, Sheila Johns, greeted the group and detailed the current status of the Lyre Association of North America as follows: LANA has 49 members to date; membership dues are $40 (regular membership) or $50 (supporting membership); LANA’s members benefit from LANA publications (Soundings and Lyre Notes), the music sales and lyre rentals programs, conferences, and news from the lyre community. The election of a new Board member and the announcement of an interim Board member were among the items of business. Cheryl Martine was elected to a three-year term and Catherine Decker was presented as an interim member, filling the remaining year of Seeya Zheng’s term. The membership also elected Sheila Johns and Colleen Shetland to another three-year term each as their terms expired in July. It was announced that the Board is seeking names for consideration as nominees for future election. Any member of LANA may recommend a name for the Board’s consideration. Please contact a Board member with nominations. 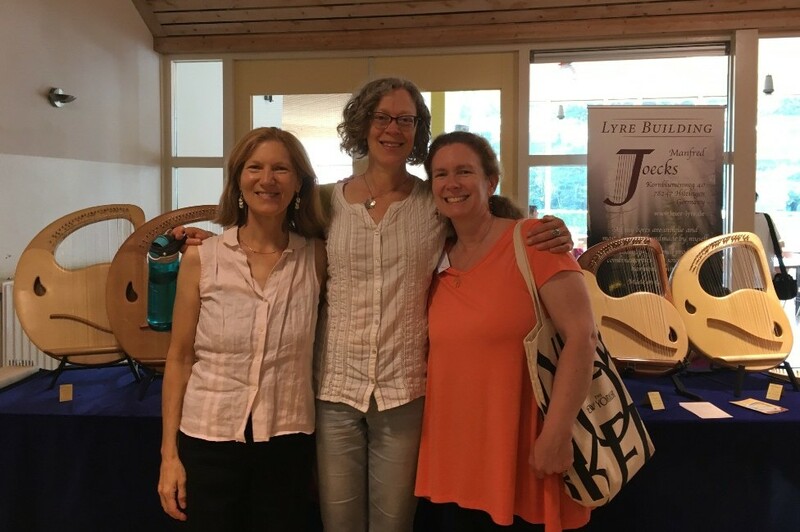 Sheila gave a report on LANA’s lyre conference rhythm which rotates through a 3-year cycle including the international conference, a Movement for Musical Renewal conference (in the U.S.), and a lyre intensive (also in the U.S.). Margo gave a treasurer’s report on the financial health of LANA (please see LANA’s Annual Report for a full overview of the organization’s finances). There were also reports on the lyre rentals program, the LANA website, Lyre Notes, Soundings journal (with a reminder to LANA members that they have all been invited to choose a piece of lyre music as a replacement for Soundings this past year -- please contact Margo Ketchum if you have not yet chosen yours). Margo Ketchum was excited to announce the introduction of LANA’s Online Music Sales Service. LANA is the first lyre association to offer such an online service! Using LANA’s music sales service, customers can pay online and have music shipped anywhere in the world. At the closing of the AGM, Sheila relayed a message from Christof-Andreas Lindenberg. She said that he is concerned about the current deterioration of listening in our world and the ability to hear tone, saying that “we need to awaken the listening capacity in people around us.” He encourages everyone to “go out and play the lyre,” adding that “the lyre wafts the air of youth” (we become old but the lyre remains young). Please share this message! 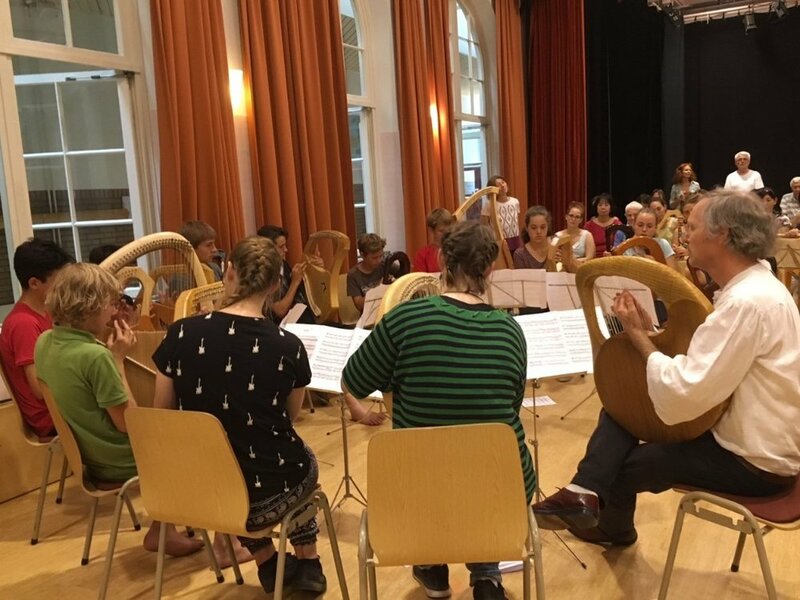 Lyre 2018 held in Zeist in the Netherlands was an inspirational week filled with workshops, concerts, shared meals and of course the daily plenum every morning. This was my third international conference and I am beginning to notice that at each one some aspect of the lyre stands out more strongly to me. In Zeist it was fascinating to hear the different qualities of tone that different types of lyres produce. In the morning plenum we were seated according to the type of lyre we played which highlighted these different qualities as Martin Tobiasson led all the conference participants in a series of improvisational exercises. I also noticed that depending on how the lyre is approached it can have a completely different sound. In Jan Braunstein’s workshop I was again reminded of the importance of listening and silence in creating music and was yet again convinced that improvisation is much more challenging than sight reading the most complex piece! With Martin Tobiasson we enjoyed playing a Swedish dance as fast as possible and then refocused to play a beautifully intricate piece called ‘For Lyre’ by Marylynn Wilson. Although this piece was not technically challenging it required very good listening! The week flew by and before I knew it, it was time to say goodbye. I left Zeist with so much fresh inspiration and a new drive to practice. I know that having the opportunity to attend international conferences over the past six years has inspired me to continue playing the lyre and I am already looking forward to the next one!